We have updated the Massasauga Rattlesnake Recovery web site. Check out the new interactive Quiz. Saturday, November 19: Highlights of Ojibway's trip to Point Pelee National Park today included a very nice look at a perched Long-eared Owl near the tip and a Golden Eagle (1 adult). Other species seen today were Red-throated Loon 1, Common Loon 3, Horned Grebe 1, Snow Goose 1, Cackling Goose 1, Northern Shoveler 4, Redhead 5, Surf Scoter 6, Ruddy Duck 1, Eastern Screech-Owl 1, Eastern Phoebe 1, Winter Wren 2, Ruby-crowned Kinglet 1, American Pipit 30, Common Yellowthroat 1, White-throated Sparrow 60 and a very late Common Green Darner. 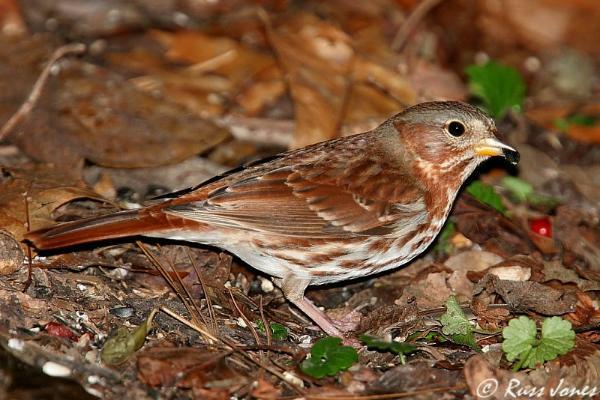 Tuesday, November 28: Russ Jones took the Fox Sparrow photo shown above at the nature centre's feeders today.